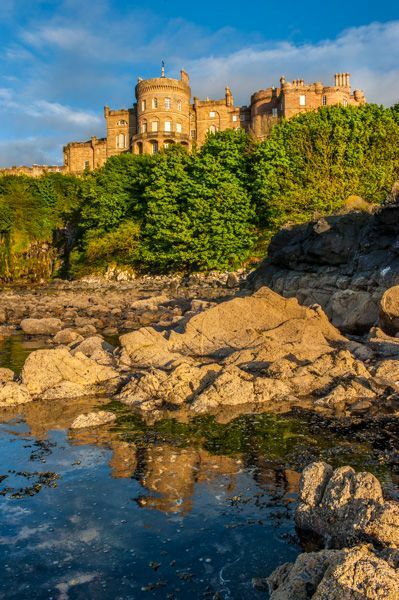 Culzean Castle is a romantic fantasy castle created by Robert Adam in 1772-1790 for the 10th Earl of Cassillis. 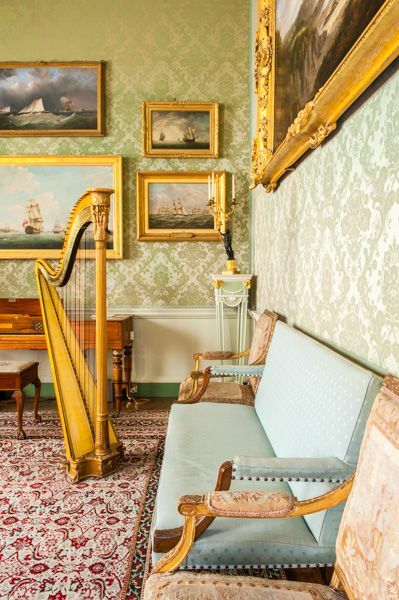 Culzean is notable for its elegant oval staircase, circular saloon, painted ceilings and delicate friezes, this is one of Adam's greatest creations. 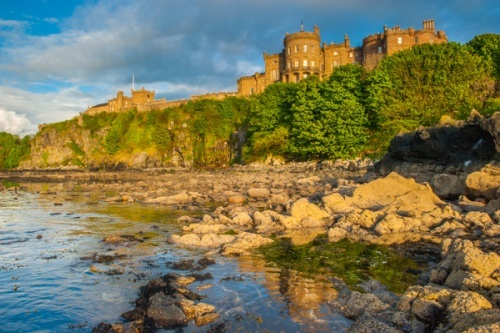 The story of Culzean is the story of the Kennedy clan, a branch of the Lords of Galloway, who were the most powerful family in the ancient kingdom of Carrick, now absorbed into Ayrshire. The Kennedy's supported Robert the Bruce in the Scottish Wars of Independence and rose to be first Lords, then Earls of Cassillis. In 1762 Sir Thomas Kennedy, the 9th Earl, decided to rebuild a late 16th century fortified tower house set on high cliffs overlooking the Firth of Clyde, about 15 miles south of Ayr. The tower house was known as Coif Castle, referring to the caves which perforate the cliffs. In the 17th century, the name morphed into Cullean, and was altered to its current spelling in the 18th century. Thomas died in 1775 and his brother David succeeded to the title. David Kennedy decided that his brother's plans were not sufficiently grand for an Earl, and he embarked on a much more ambitious plan to create a stylish, romantic stately home on the foundations of the earlier house. To that end, the Earl called in Robert Adam, the most popular and influential country house architect of the day, and a master of Palladian style. Robert Adam spent 15 years overseeing the transformation of Culzean into one of the most imposing and fashionable stately homes in Scotland. To the earlier L-plan house Adam added a kitchen block and new three-storey wing, with later brewhouse, milkhouse, and bedrooms at one end. He tore down the wing erected by the 9th Earl and built an imposing drum tower on the very edge of the high cliffs. The new structure was decorated with all the fanciful attributes of a romantic Gothic fortress, with battlemented turrets and towers creating a picturesque outline. But the castellated exterior of Culzean was only the beginning; Adam's best work was saved for the interior. 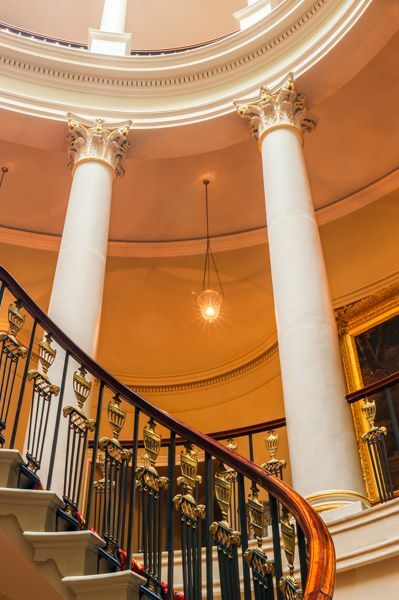 at the centre of the house, lit by a domed cupola skylight in the tower roof, is one of Adam's great creations; an oval staircase supported by Ionic and Corinthian columns, leading visitors to a Round Drawing Room on the first floor, where windows on all sides create a panoramic view of the Clyde. This is perhaps the most impressive room at Culzean and is one of Adam's most extravagant works. At some point, the ceiling was whitewashed, and it was only when drawings by Adam were discovered detailing his original design that the whitewash was removed to uncover the magnificent plasterwork and paint scheme that makes this room one of Adam's most celebrated creations. 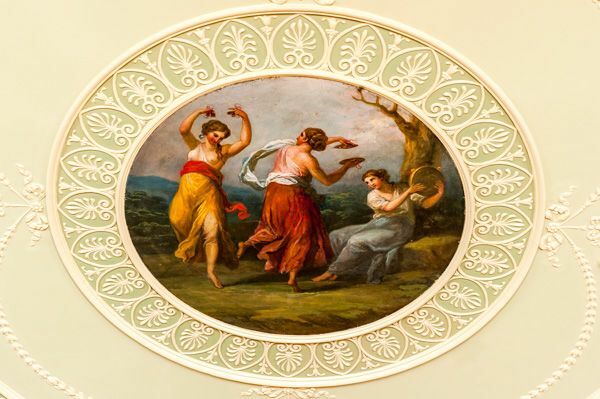 Adam's other public rooms are a symphony of neoclassical style; with delicately painted ceilings adorned with exquisite plasterwork. 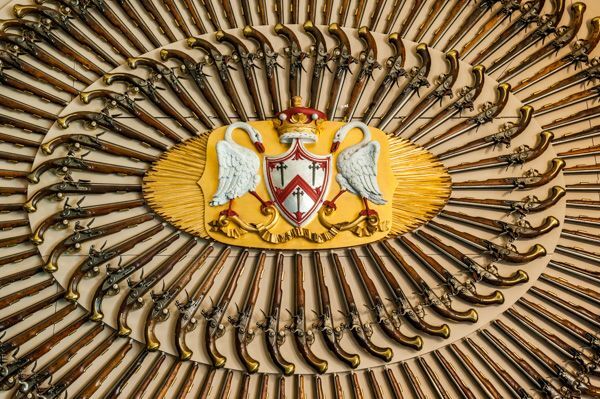 One of the first rooms you come to a visitor, however, has nothing delicate about it; this is the Armoury Hall, decorated with displays of flintlock firearms and historic swords. This collection is one of the finest in the world, and one of Culzean's great treasures. In 1945 the Kennedy family gave the castle to the National Trust for Scotland, with the proviso that the top floor of the castle was to be offered to General Dwight Eisenhower as a gift of thanks from the Scottish people for his role in World War Two. Eisenhower came to Culzean 4 times, once while President, and the longest period of time after he retired from public life. The Eisenhower Apartment is now used as luxury accommodation and is very popular with American visitors. Culzean will forever be associated with General Eisenhower, but the Kennedy association with America goes back much further, to the early 18th century. Archibald Kennedy, a cousin of the Earl of Cassillis, became receiver general of customs in New York and purchased numbers 2 and 3 Broadway (the latter as a warehouse space). His son, also named Archibald, was born in America, and in time became a successful sea captain. He made his fortune seizing ships for prize money during the Seven Years War, and later commanded transport ships in the American War of Independence. He built a luxurious residence at No. 1 Broadway, the most prestigious address in New York. Kennedy's house served as the British command centre during the war, and in a curious twist of fate became George Washington's residence after the war. When the 10th Earl of Cassillis died childless in 1792 the 'American Earl' succeeded to the title. A full-length portrait of the Earl in state robes hangs on the wall of the Oval Staircase. Below the castle is a board terraced lawn with an ornate fountain in the middle. At one end of the terrace is a lovely orangery, and the other end leads to the viaduct built by Robert Adam to link the castle to a ruined arch that now acts as the main visitor entrance to the site. The viaduct leads through another archway to the Clocktower Court, where you will find an exhibition on the history of Culzean and other more practical visitor facilities. Below the Clocktower Court, steps lead down the hillside, where wild garlic grows in Spring, to the shore, where you will find old gas works, built to provide power to the castle. at the other side of the castle garden is a Victorian battery, with a row of guns pointed out to sea. Beside the battery, a path leads down steep steps to the shore, where you can walk for 3 miles along a mix of sand and rocky beach. The view from the beach as the sun goes down in the evening, with the castle looming high on the cliffs above, is incredibly romantic! A short walk from the castle itself is the Walled Garden, which once supplied food for the castle. The gardens are a full kilometre from the castle, so the location couldn't have been terribly convenient! Within the walled garden is a Victorian vinery, and trails lead from the garden through pleasant woodland to the Swan Pond, a 5-hectare lake that is home to swan and geese. Families will also want to visit the Deer Park, located directly beside the main castle car park, where deer graze so close to the fence that you could almost reach out and touch them (don't!). 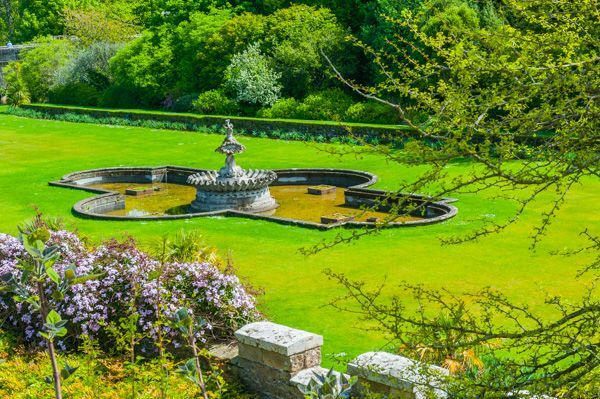 The grounds of Culzean are part of a country park (not National rust for Scotland) and are open every day throughout the year from dawn until sunset. The 'Z' in Culzean is silent, and the name is pronounced like 'Cullane'. 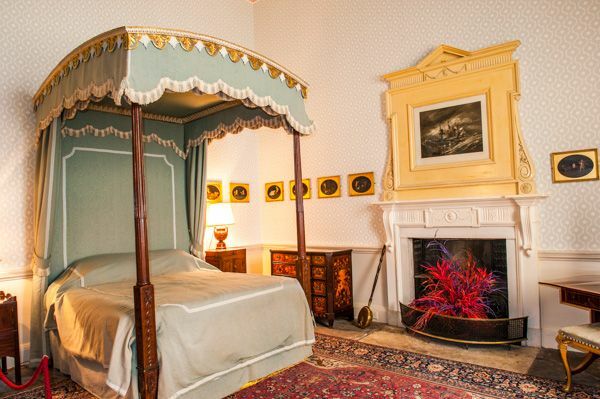 Nearby accommodation is calculated 'as the crow flies' from Culzean Castle. 'Nearest' may involve a long drive up and down glens or, if you are near the coast, may include a ferry ride! Please check the property map to make sure the location is right for you.